Preheat the oven to 180°C/Gas 4. Grease and line the bases of three 18cm loose-based sandwich tins with baking parchment. To make the cake, cream the butter and sugar together in a mixing bowl with an electric hand mixer until pale and fluffy. Beat in the eggs a little at a time and stir in the vanilla extract. Gradually sift and fold in the flour and baking powder using a large metal spoon. Divide the mixture between the prepared cake tins, levelling the surface with the back of a spoon. Bake for 20-25 minutes or until golden brown on top and a skewer inserted into the centre comes out clean. Remove the cakes from the oven and leave to cool in the tins for 5 minutes. Carefully remove the cakes from the tins, peel off the baking parchment and transfer to a wire rack to cool completely. To make the strawberry compote, add the strawberries, icing sugar and balsamic syrup to a medium saucepan. Cook over a gentle heat, stirring occasionally, for 8-10 minutes until the berries are softened but still holding some of their shape. Set aside to cool. Using a serrated bread knife, level the top of each cake and discard any off-cuts. To make the buttercream, place all the ingredients in a medium-sized bowl and beat with an electric hand mixer for 2-3 minutes until pale, light and fluffy. 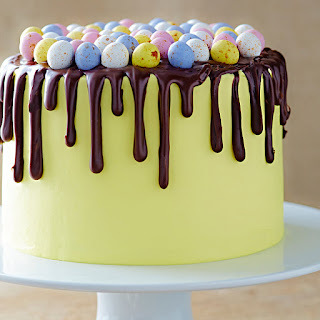 To assemble the cake, begin by spooning a small amount of buttercream onto the centre of a cake stand or plate to hold the first cake in place. Spread a layer of buttercream over the top of the cake, then a layer of strawberry compote, and repeat with the second cake. Place the final cake on top, then spread buttercream thickly and smoothly all over the sides and top of the cake. Chill the cake in the fridge for 15 minutes, then apply a finishing coat of buttercream all over to give a smooth finish. Chill the cake again for 15 minutes. Warm the chocolate fondant as per the instructions. Mix in the orange extract and spoon onto the centre of the cake, allowing the fondant to trickle down the sides. 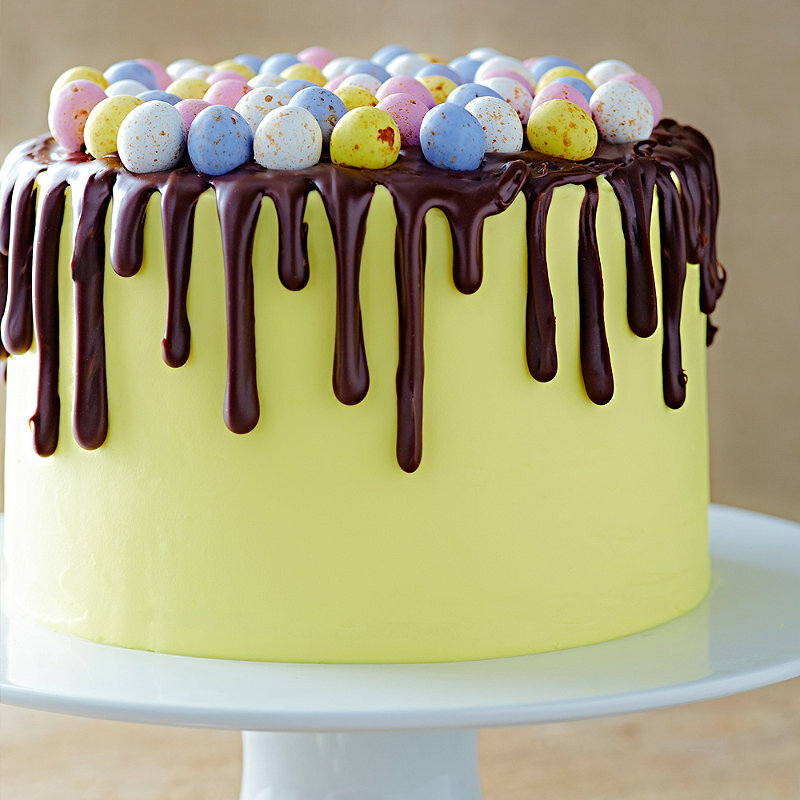 To finish, decorate the top of the cake with the chocolate mini eggs while the fondant is still soft.